HomeArtPoll: Who’s your favorite supporting Fox? Zootopia’s first fox, is, of course, Nick Wilde. He’s the best. No question. But there are two other foxes that we know Judy knows. Is it the Vulpine of Pie, Gideon Grey? Or is it the Costumed Con, Finnick? Let’s find out! The poll is on the right! I know Finnick will win, but Gideon deserves love too. Perhaps I just have a fondness of characters who start out bad but get redeemed. Finnick might of course get an opportunity like that in the future, but right now, that means I'm siding with Gideon on this one. I'm not surprised that Finnick would probably win. Seriously I love him as well. I mean, who could forget his reaction after Judy out hustled Nick? Come on. The words are already playing in your mind. "She hustled you. Ha ha ha! She hustled you good! 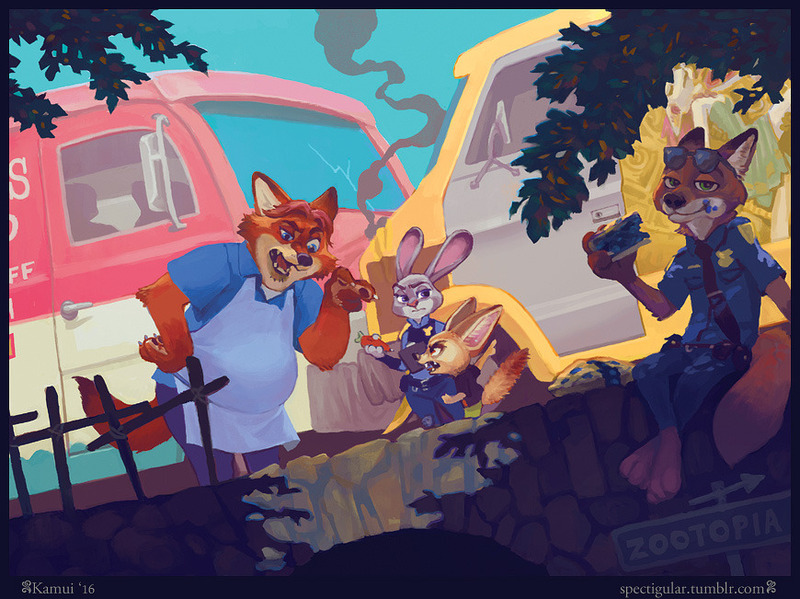 You a cop now, Nick! You gonna need one of these! Have fun working with the fuzz!" Had to type all that out. As much as many people love Finnick, I gotta give my vote to Gideon Gray! For one reason: He was an antagonist in the beginning that turned good later on in the movie! At first, a character we've despised when he bullied the little animals. And scratched Young Judy as well! But who could've expected he turn a new leaf and is now friends with Judy's parents?! And is now a great baker at pies! Seeing that reveal made me want to applaud for him. Plus, he was the spark that made Judy follow her dreams and ignited a cool, comeback line. "He was right about one thing. I don't know when to quit." That's why I tip my hat to the great Gideon Gray; living proof that it's never too late to change your ways and make a positive impact in your community. Finnic the Fennic. He exudes cool. Finnic was cool, and Nick made me draw closer to the character, but the one I like the most is Gideon Gray. Even with his small part, he made me appreciate that people you thought were lost causes can change for the better.